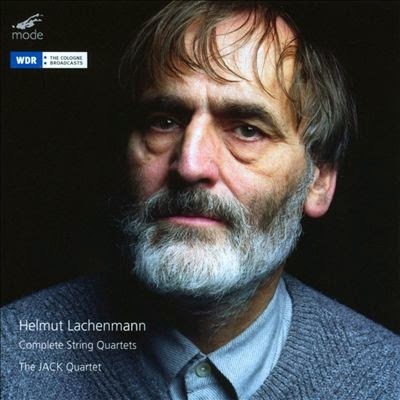 The string quartet is a natural medium for Helmut Lachenmann. He has pioneered extended performance techniques on all sorts of instruments, and made them central to his art, but string instruments have always offered him the widest range of possibilities. The chamber music context is also ideal for expressing Lachenmann’s curious relationship with silence. He often takes his music right down, and beyond, the limits of perception, an effect that a small ensemble of strings is ideally suited for. Lachenmann’s three quartets (they’re usually numbered, but not here) punctuate his career. Gran Torso was completed in 1972, Reigen seliger Geister in 1989 and Grido in 2001. All are around 20-25 minutes, and so comfortably fill a CD. Stylistically, the similarities outweigh the difference, but they are clearly distinct pieces. Gran Torso is the best of them. It is a kind of manifesto of Lachenmann’s approach. Pitched notes are very rare here, replaced by growls, pops and slides. The textures are ascetic, the better to hear the sounds in the individual parts, and the ensemble works through a kind of shared commitment to a sound that, at any given time, could probably be created just one or two players. It is sophisticated music though, and deeply involving. Reigen seliger Geister, composed around the time Lachemann was beginning work on his opera The Little Match Girl, introduces more conventional sounds: pitches, usually held, overtone series played as harmonics, even recognisable rhythms. Yet these feel like guests in a musical environment still dominated by the scratches and pops. By the time we get to Grido, in 2000-2001, Lachenmann has expanded even further into the traditional vocabulary. Textures are denser here, and the musical ideas often involve some or all of the players working as a unit. There are even suggestions of harmony, although the chords in question are acerbically dissonant. The JACK Quartet, one of the better young quartets dedicating themselves to avant-garde music at the moment, worked closely with the composer in the preparation of these performances, and the results are excellent. Despite the earthy, and often imposing, soundscapes, the JACK players are able to bring life and detail to all the textures. Tone colour is clearly the basis of much of this music, and in these performances that is always the driving concern. The sheer variety of colours and textures the players find in these scores ensures continuous interest. They are also able to provide these diverse sounds at the very lowest dynamics. There are at least two other recordings available of the three quartets, from the Stadler Quartet on NEOS and the Arditti Quartet of Kairos. All are good, but this new JACK Quartet version deserves the top ranking. The Ardittis, as ever, are a tough act to follow, and their version has the advantage of a sweeter, rounder tone (if that is an advantage here – they seem to make it so). The Ardittis programme the works in reverse order, perhaps because the Third Quartet is dedicated to them. Curiously, both their recording and this one where produced in collaboration with WDR. But the sound quality here is superior, giving greater immediacy to the ensemble and greater depth to the soundstage. This is music that needs to be felt as much as heard, and you really get the feeling of tactile engagement here in a way that previous recordings haven’t quite managed. Given the unusual performing techniques, being able to see the players would also be an advantage, and, as it happens, this recording is also available on DVD, and with surround sound. Even better still.